All-rounder Paul Best plans to make an impact at Warwickshire this season after an injury-hit campaign in 2013. The ex-England-Under-19s captain, now 23, hoped to take big strides in the game last summer, starting the season for the county champions in Abu Dhabi in the curtain-raiser against the MCC. But a back injury led to Best failing to make another appearance in 2013. Seven of Best's 11 first-class appearances have been for Cambridge University. Both his two County Championship appearances came in 2011, at opposite ends of the country. He made his Bears first-class debut against Durham at Chester-le-Street in April, taking three wickets in the match. 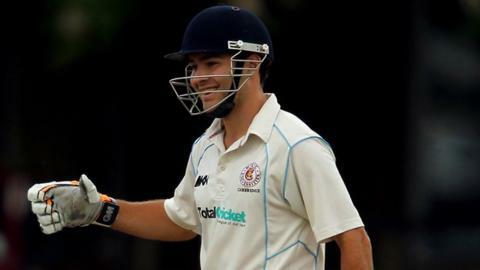 He then went on loan to Northants at the end of the season and played against Glamorgan at the St Helen's Ground, Swansea., making an unbeaten 30 and completing a match haul of two wickets for 153 in 47 overs. His star performance came in the middle of that summer, taking 6-86 to win the Varsity Match for Cambridge at Lord's. "It was disappointing to miss a full season. But I'm fit now and I've worked hard this winter," he told BBC Sport. "It makes me hungry to do well after a good winter's rehab." In a freakish season of endless sprains, tweaks, niggles and breaks, Best was, of course, by far from the only Warwickshire batsman plagued by injury last summer. Both his own county captain Jim Troughton, who misses the start of the new season, and England Lions fast bowler Chris Wright had similar back problems. And the only headlines Best made came as Warwickshire Second XI captain late last summer when the county were fined £5,000 after being reported for ball tampering with a Murray mint in a game against Glamorgan. But it helped sweeten a frustrating summer for Nuneaton-born Best that Warwickshire showed their faith in his long-term development by handing him a two-year contract at the end of last season. And, having once again been chosen for the county's opening first-class fixture of the season, Best looks in the mood to take his chance. While Jonathan Trott was failing against the Oxford University students in The Parks this week, Best was one of four Bears batsmen to raise his bat in acknowledgement of a half-century. After a rain-ruined first day, he made 50 not out in his side's declared total of 388-7 on Tuesday, and Best sees a sustained improvement in his batting as essential if he is to truly challenge for a place in 2014. "It's good to have three strings to my bow, in terms of bowling, fielding and batting," he added. "Being able to contribute down the back end is very important." But his six overs of slow left-arm spin went for 30 on Wednesday, and New Zealand Test spinner Jeetan Patel is expected to start Warwickshire's first Championship game against Sussex at Edgbaston on Sunday. The availability of England duo Trott and Ian Bell for the opening few Championship matches further limits opportunities for the Bears' fringe players. Warwickshire have not lost a home Championship match to Sussex since 1982, when the Bears were bowled out for just 43 in their second innings, to lose by 269 runs. The Bears have won 10 and drawn 12 of the 22 matches since. And the only decision ahead of the Sussex game appears to be whether to go with an extra seamer in fit-again Oliver Hannon-Dalby, another who missed most of last season through injury, or opt to bolster the batting by playing Ateeq Javid. It is such competition for places that makes Best well aware that, after finishing his studies in Anglo-Saxon, Norse and Celtic at Cambridge University, he now faces his biggest examination. "I've been away at university for the last three years," he said. "But I'm looking to play a lot of cricket now. "I hope to feature heavily in one-day cricket. We were all disappointed in how we performed in limited-overs cricket last summer and a lot of work has been put in over the winter months to get it right. "And, if we get some spinners' wickets, I'll be looking to play a part in the Championship too."